Arllette is a Maryland licensed and nationally certified Speech-Language Pathologist. Arllette has been practicing since 1995. 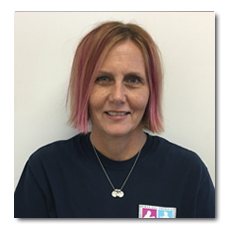 She has experience working with children ages toddler to young adult in the school setting, as well as, in private practice. Arllette has received training in the Beckman Oral Motor Protocol and in the Developmental Individual-differences Relationship-based model (DIR) . She recently received her 2nd ASHA ACE Award for earning 7 ASHA Continuing Education Units which is equivalent to 70 contact hours in a 36 month period. Arllette also enjoys treating children with complex articulation difficulties. She regularly consults with the Occupational Therapists on staff to help implement sensory support strategies in her sessions. Arllette is certified in CPR.